Learn more about how helicopters can benefit your agricultural operation in Missouri. FairLifts schedules aerial applications in Missouri for farms and growers, including wet or dry spraying for fertilization, pest control, frost prevention, treatment, and watering. 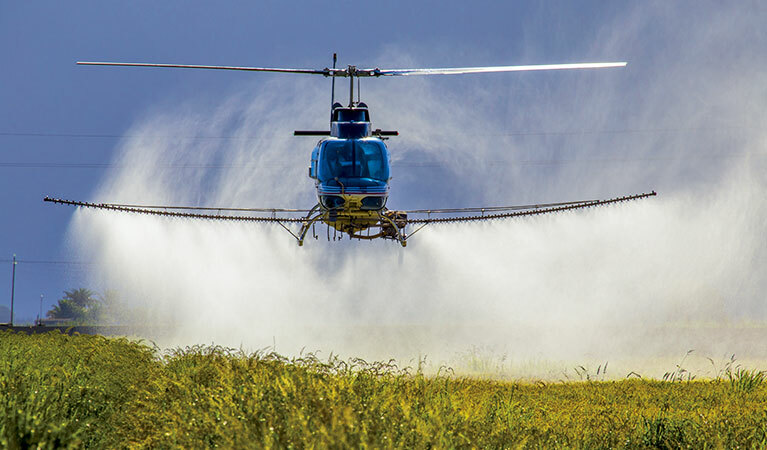 Aerial application, which are cost-effective and efficient, are the future of agricultural treatment solutions, enabling spraying and protection of vital crops. Helicopters allow farmers to access remote and rugged areas with minimal environmental impact. Treatment chemicals can be mixed and loaded directly on the nurse/platform trucks that transport helicopters, saving time and transportation costs. 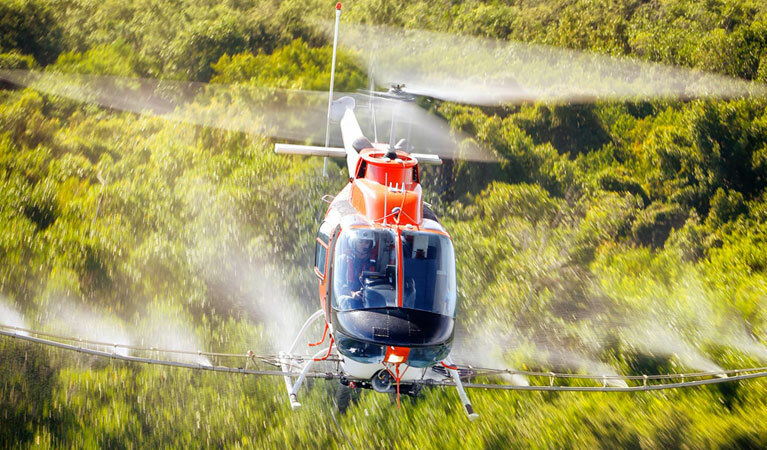 The Robinson R44 and BELL 47, frequently used in aerial spraying, are smaller helicopters that carry large quantities of spray, thereby minimizing reloading times. FairLifts schedules aerial application solutions for farmers and growers throughout Missouri and offers additional solutions, such as crop surveys, line inspections, frost prevention, and more. Our network of operators hold Growsafe and Chemical handling certifications, and all helicopters are equipped with DGPS to ensure precise applications. Missouri has nearly 100,000 farms that span more than 28 million acres, producing crops and commodities, such as soybeans, cattle and calves, corn, hogs, and broiler chickens. The state has over $13 billion in farm revenue, exporting corn, soybeans, soybean meal, feed and pork, which contribute nearly $5 billion to the state’s economy. The state operates under the umbrella of “one agriculture,” meaning that aside from growing individual crops, the state’s farms contribute to the production of leading exports like corn and soybeans in order to further Missouri’s agricultural industry. FairLifts schedules an of array of aerial application solutions in Missouri, including dry and wet spraying, crop treatment and frost protection. Helicopters provide precise and uniform coverage of crops with minimal environmental impact, enabling timely and cost-effective solutions, as well as ensuring premium quality harvests and increased revenues. The following are a few of the services provided for aerial applications in Missouri. FairLifts schedules helicopters for precise and consistent crop dusting, topdressing, fertilizing, watering or hydroseeding. Our network of operators provides superior aerial application services, including mixing of fungicide and crop protection products, spraying of fertilizer and hydroseeding over extensive areas in record time. FairLifts schedules helicopters for mosquito and pest control, protecting farms from lost revenue and degraded crops. Our network of operators provides access to rugged and remote areas with minimal environmental impact, limiting pesticide and spray drift, and providing precise adulticide and larvicide applications. FairLifts schedules helicopters for brush and weed control, enabling access to inaccessible areas. Our network of operators provide aerial applications of herbicides to ensure protection from noxious weeds and brush encroachments, thereby safeguarding valuable crops. FairLifts schedules helicopters for aerial applications of frost prevention and treatment solutions that provide year-round protection of farmland, particularly during the winter months when crops are most vulnerable. Our network of operators provides periodic treatments for guaranteed protection. FairLifts, working with a global network of operators, ensures advanced aerial application solutions for farmers and growers in the state of Missouri. Expert pilots provide targeted and consistent coverage of crops for remarkable results. Our account managers are on hand 24/7 to schedule professional aerial application services, as well as to provide planning, pricing, and insight regarding aerial application solutions in Missouri.